It's just down right sad in Cleveland these days. Losing LeBron and now losing an NBA record 25 straight games. We just thought the Cavs needed something, anything and sometimes you just need a hug or to dance a jig. 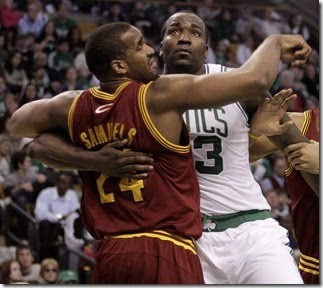 Kendrick Perkins of the Celtics felt the same way as he attempts one or the other with Cleveland forward Samardo Samuels.